This year our additional Christmas Collection Market will be held Sunday 23rd December (as well as the normal Market on Saturday 15th December). Pre-order your turkeys online here for collection and come to pick up last minute fresh veg! 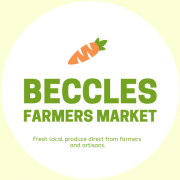 We’re looking forward to seeing you again this Saturday for Beccles Famers Market. You’ll find a varied selection of delicious fresh local food and artisan products between 9am – 1pm. We’ve got all kinds of fresh seasonal veg alongside the usual selection of; Locally reared Beef, Pork, Chicken, Lamb, Fresh Veg, Handmade Jams, Marmalades & Chutneys, freshly caught and traditionally fish and cheese, wood turners, carvers & jewellery makers, hand-made Belgium chocolate truffles, pressed apple juice, free-range woodland eggs, various baked goods… phew! We look forward to seeing you there – don’t forget to wrap up warm! Next market will be Saturday 1st December, followed by Saturday 15th Dec. The Christmas special market will be held on Sunday 23rd of Dec.